The Haunted Shipwreck Trap is a Limited Edition Hydro type weapon. 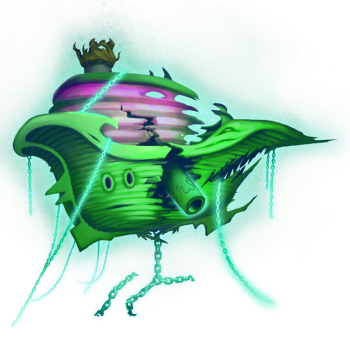 A sunken ghostship wrested from the command of Captain Cannonball, it has been salvaged and repurposed by paranormal trapologists to function as a high-powered Hydro trap. Its main traditional cannons have been replaced with a giant water cannon, and the main rig has been wrapped ever so gently in spectral chains to prevent it from floating away. Having a haunted ship of your own has its benefits. It can seek out treasure from other haunted ships and notify you of its presence. Hunting with this trap in the Sunken City will help you find extra loot when exploring Haunted Shipwrecks. The Haunted Shipwreck Trap is an Limited Edition weapon and can no longer be acquired by Hunters. It was not sold by any Trapsmith. It can only be obtained by completing the Capture Captain Cannonball Adventure Book quest. Sunken City: With the Haunted Shipwreck Trap armed in a Haunted Shipwreck zone, bonus loot can be obtained. These include Barnacles, Mouse Scales, Damaged Coral Fragments and Undead Emmental Potion. Depth Charge Base: Provides a power bonus when hunting in Sunken City. 17 October 2017: The Haunted Shipwreck Trap was released as part of the Halloween 2017 event. This page was last edited on 12 January 2019, at 13:49.